David W. Hoyt, The old families of Salisbury and Amesbury Massachusetts : with some related families of Newbury, Haverhill, Ipswich, and Hampton, and of York County, Maine / David W. Hoyt., Vol. 2, , at https://archive.org/stream/oldfamiliesofsal02hoyt . Providence, R. I.: Snow & Farnham, (1897) , p. 625. David W. Hoyt, The old families of Salisbury and Amesbury Massachusetts : with some related families of Newbury, Haverhill, Ipswich, and Hampton, and of York County, Maine / David W. Hoyt., Vol. 2, , at https://archive.org/stream/oldfamiliesofsal02hoyt . Providence, R. I.: Snow & Farnham, (1897) , p. 633. Vital records of Salisbury, Massachusetts, to the end of the year 1849, Topsfield, Mass. : Topsfield Historical Society, (1915) , p. 21. Rev. 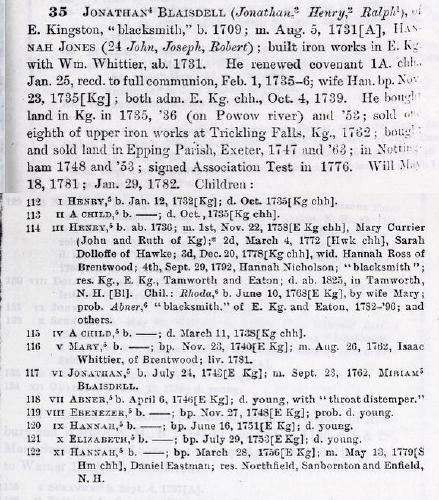 Elliott C. Cogswell, History of Nottingham, Deerfield, and Northwood, , at https://books.google.com/books?id=dphAAAAAYAAJ . 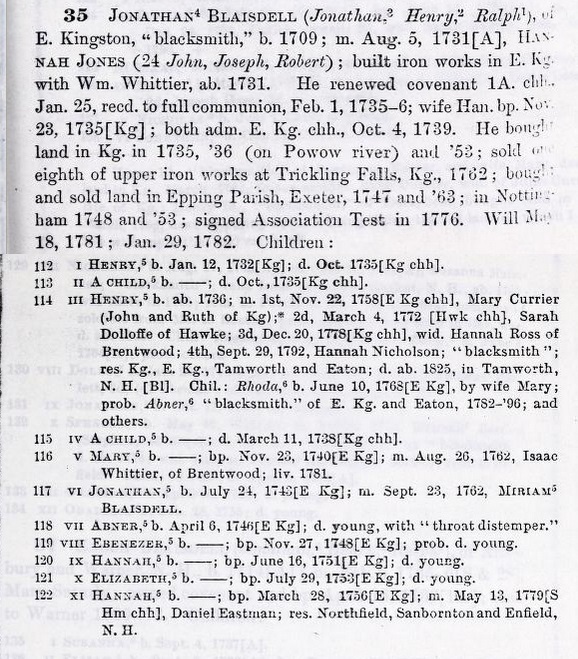 Manchester: John B. Clarke, (1878) , p. 493. Mary Blaisdell was born perhaps about 1684.